Baci Italian Café, a home-grown brand by Chaswood Resources Ltd, is launching a special Christmas campaign to fund a buffet spread for the underprivileged children of Ti Ratana Welfare Society at their outlet in Citta Mall, Ara Damansara. 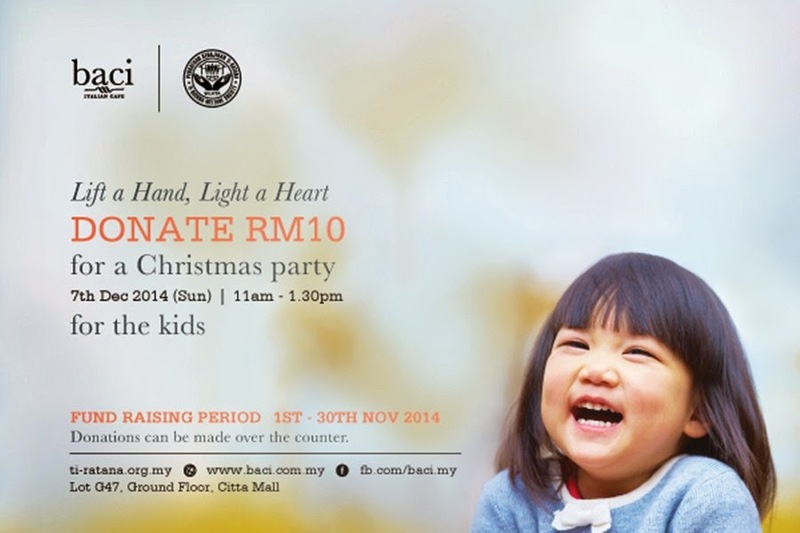 From tomorrow onward (1st November 2014) till 30 November 2014, patrons will encouraged to contribute a minimum of RM 10. The money that being contributed will be use to organising a Christmas buffet party for underprivileged. The Christmas party will be on Sunday, 7th December 2014, for children of Ti Ratana Welfare Society. Not only that, there will be magic show for the Christmas party for the children. There will be also a scrumptious buffet of Baci's singature Italian-styled sandwiches, savoury handmade pizzas, hearty pastas and Christmas-inspired desserts and cakes for them. I think this would give a sweet and memories moment for the children of Ti Ratana Welfare Society for celebrating their holiday season. A short introduction of Ti Ratana Welfare Society. This society is a not-for-profit welfare organisation that includes 6 shelters for children, old folks and women located in Bangsar, Puchong, Klang, Penchala, Cheras and Kepong. They currently house 176 children and 120 old folks with ages ranging from 4 months to 93 years. Before I end, I hope that whenever you visiting Citta Mall Ara Damansara, do drop-by Baci Italian Café for a tea-break, lunch or even dinner and donate RM10 (importnat must be generously). I would like to thanks behalf of Ti Ratana Welfare Society for your kindness. Guess what I will visit Baci Italian Café and donating too.For more information, log on to http://baci.com.my or visit http://www.facebook.com/baci.my.